‘Tis the season of shopping and crowds — long lines and even shorter tempers. The back-to-back diet-busting parties. The interminable chats with the in-laws. When we are so busy, disembodied and constantly multi-tasking, it is easy to feel not so great at this most wonderful time of the year. Well, I have two words for you: yoga nidra. But there’s more: research conducted by Stanford University, Walter Reed Army Medical Center, Ohio State University, Medical College of Ohio, Banaras University and others, shows that regular practice of yoga nidra offers a viable means of prevention and reversal of numerous ailments and diseases, including cardiovascular, stress-related illness, chronic pain, and psychosomatic conditions. It also strengthens the immune system, helps regulate blood pressure, balances the nervous and endocrine systems, improves sleep and aids insomnia, as well as helps alleviate stress-related illnesses, which are 99% of illnesses today. Best of all, 20 minutes of yoga nidra is said to be equivalent to three hours of sleep! I recently took Jennifer’s Divine Sleep Yoga Nidra® class to experience it for myself. First, I got nice and comfortable on my mat. Through the use of props, which included a bolster under my knees and three blankets (one to lie on, another under my head and a third to cover me), and finally an eye-pillow, I felt prepared for the long lie-down to come. Guided by Jennifer’s voice, I began to identify sensations throughout my body. Through the use of breath awareness, body scanning, healing music and nature imagery, I became aware of each layer of being. There was no need to change or fix anything. Instead, the practice just offered me a rare opportunity to just be and accept what is. To be honest, I think I dozed off for a few minutes. And yet I left feeling like I had caught up on my lack of sleep over the course of the entire month, leaving me strangely energized and with a profound sense of inner peace. Following Jennifer shares more about her amazing journey of how she found yoga nidra, how she has translated into a tool for others — and what it can do for you. Read on! When did you first experience yoga nidra? I first experienced ‘guided relaxation’ while on an overnight bus trip during art school in the 90’s. It was actually the bus driver who led us in some of the elements of yoga nidra to relax us and put us to sleep and he was very skilled. It felt like the first time I had ever consciously gone beyond my ‘personality’ or small self to feel and know the larger true Self. That same year I began taking yoga classes and the teacher always led a deep, guided relaxation in savasana. I was hooked from the first moment and wanted to know more! One is guided to bring awareness to every level of being (koshas in Sanskrit) and this in turn allows each level to relax. This includes the physical body, energy and breath, mind and emotions, witness consciousness, healing, and joy levels of being. This is true meditation where there is nothing to do but to ‘notice’ — supporting you in feeling empowered and whole just as you are. How did you know that you should develop your own experience? I developed Divine Sleep Yoga Nidra® quite naturally from leading students and wanting to bring them everything I had in my toolbox. I am on faculties of both Kripalu Center and Integrative Yoga Therapy; I’m a long time meditator and practice Ayurveda and Traditional Chinese Medicine as well as have a background in visual arts. I have always been outdoors in nature enjoying the elements for joy, balance and healing and amazingly the effects are the same even if you simply imagine yourself in nature. How often do you recommend practicing Yoga nidra as it relates to one’s regular yoga practice? It is best to practice daily – we need relaxation daily to turn off flight-fight-freeze and switch into our natural healing state of the relaxation response. Divine Sleep Yoga Nidra® can be practiced after asana/postures during savasana pose, or on its own at any time of the day. As soon as you awaken or right before bed are the best times to meditate. Also just before a meal, especially dinner, instead of having a drink or something to calm the nerves. How does yoga nidra transform stress into healing? Divine Sleep Yoga Nidra® turns your senses inward for thorough restoration, giving you quality time within yourself and access to your innate wisdom. A deep sense of integration occurs in body, mind and spirit. It can also reduce pain, lower high blood pressure and cholesterol levels, assist with PTSD (post-traumatic stress disorder), ADHD, psychosomatic illnesses like allergies and asthma. The reason that it helps with a variety of illnesses is because it swiftly brings you into your natural healing mode – the parasympathetic nervous system – which is the counter of flight or fight. Many people feel it difficult or stressful to meditate in silence but find it very calming and relaxing to meditate being guided by a voice. Adding Yoga nidra to your toolbox will likely help you stay happy, healthy, and energized through the new year. And if you can’t make time for a full practice, consider spending just 15 minutes alone, without distractions, which will likely refresh you enough to handle everything you need to do. 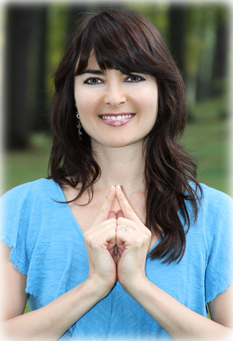 Jennifer Reis, E-RYT 500, Kripalu faculty, Integrative Yoga Therapist and faculty, LMT, and BFA. Jennifer founded Divine Sleep Yoga Nidra® with a goal to help others your senses inward for restoration and peace as you spend quality time with yourself, your thoughts and feelings and sensations, as well as opening to your innate wisdom, intuition and healing. A deep sense of integration settles the chaos of one’s life as we have time and space to feel ourselves. Kirsten is a writer, yoga instructor and a mother of two living in Barcelona, Spain. While Kirsten has been a yoga enthusiast for more than 15 years, her life shifted when her practice moved off the mat. Her mantra: "I do not do yoga. Yoga does me." She is currently working on her upcoming novel, "Butterflies of Barcelona," a story about an American family finding joy in the slower and more inconvenient culture of Spain. You can visit her website at Yogasimple.net. Yoga enthusiast, lover of meditation, and all around very healthy eater.